Hey, party peeps! 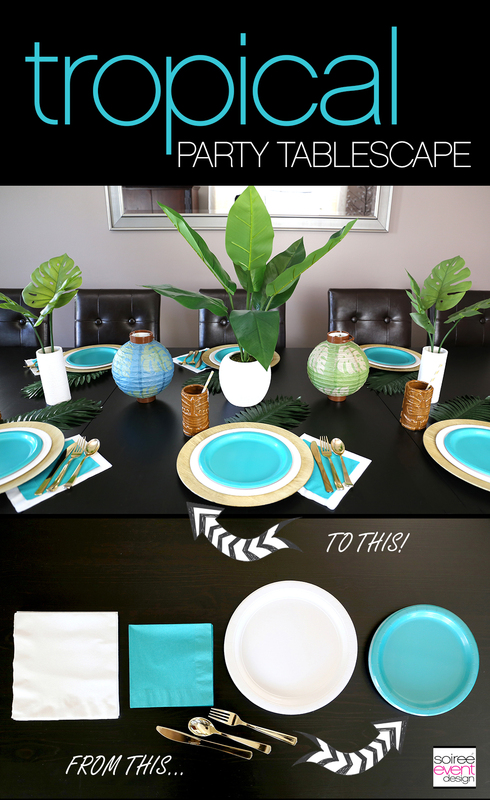 I’m continuing today with my Tablescape Design Series where I share with you how to style a dining table 5 different ways for 5 different party themes using solid colored tableware. 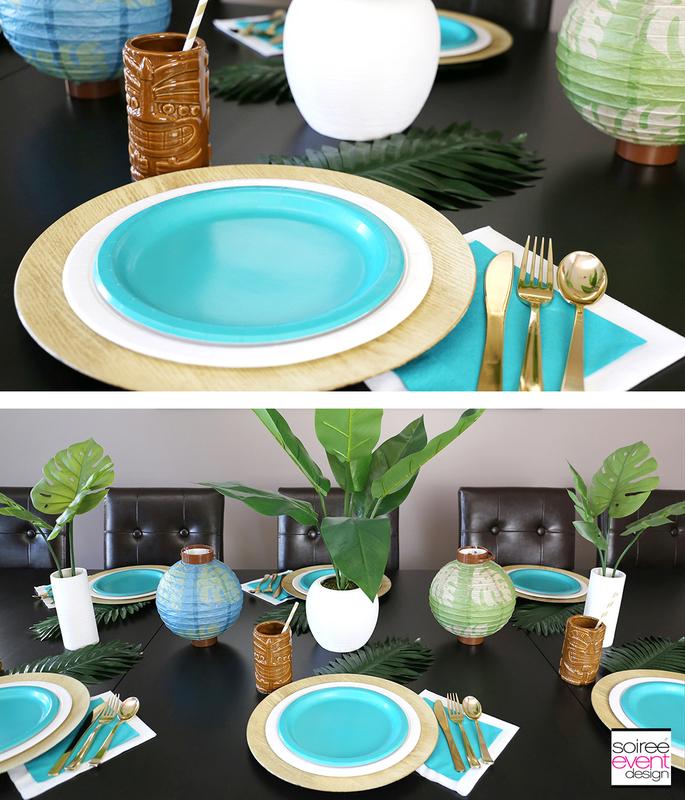 Today it’s, HOW TO STYLE A TROPICAL PARTY TABLESCAPE! 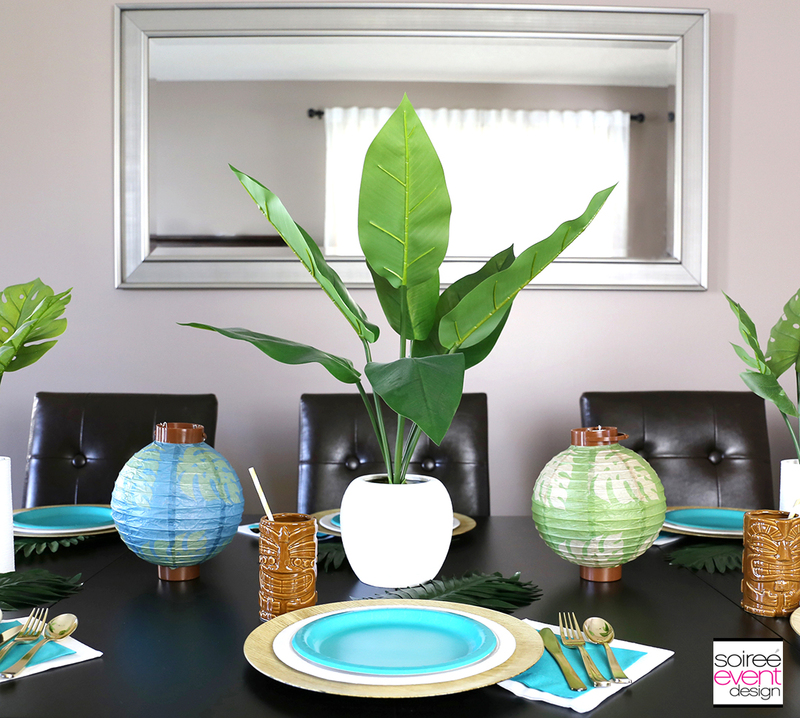 I know, I know, summer is almost over, but I can’t help but hang on a little while longer and show you guys this fabulous Tropical Party Tablescape that is perfect for adult dinner parties. I live in a cold-weather climate so hosting parties outside is normally hard outside of the summer months, so I’m always looking for ways to bring the tropical, outside element inside year-round. Check out my Girlfriend Tips throughout this post to make setting this up yourself easy and stress-free…AND…be sure to go to the end of the post for an online shopping list of what I used to design this tablescape, so you can easily recreate this yourself! 1. GIRLFRIEND TIP: START WITH DISPOSABLE SOLID COLORED TABLEWARE! To give this table a modern look, I started with a color palette that reminded me of a tropical island. Blue for the sea, gold for the sun and white for the clouds. 2. GIRLFRIEND TIP: ADD NATURAL ELEMENTS TO YOUR PLACE SETTING! I also think of wood and green tropical leaves when I think of a tropical setting, so I layered the solid colored plates on top of a wood charger and placed a large green tropical palm leaf under each charger. To add a bit of shine, like the sun on a tropical beach, I used metallic gold cutlery that…guess what…are disposable! OH YEAH! 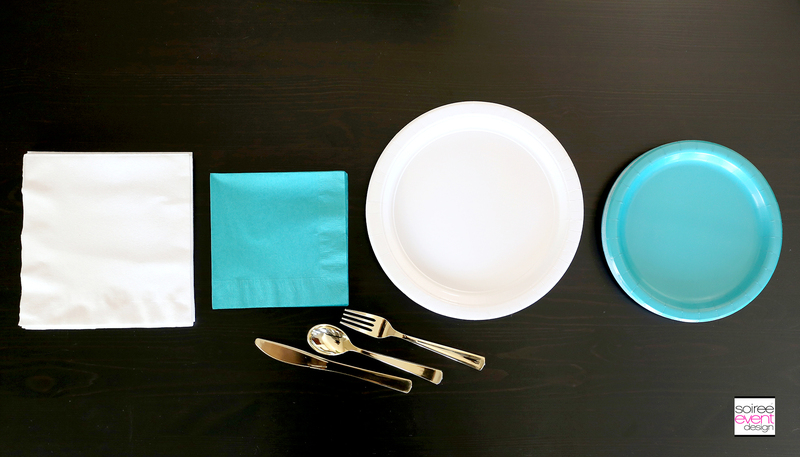 Using a charger under paper plates gives your place setting a more high-end look. Chargers come in so many colors and styles that you can find one to match almost any party theme. A new trend that has emerged in tablescapes are these wood chargers and they are just fabulous, don’t you think? Reminds me of bamboo on a tropical island. PERFECT! 3. GIRLFRIEND TIP: USE GLASSWARE INSTEAD OF PAPER CUPS! I do this for all my adult parties. I keep an inventory of clear glassware and sometimes if the budget allows, I’ll look for themed glassware to match my party’s table design like I did here with these ceramic tiki tumblers from Oriental Trading. These ceramic tiki tumblers are $12.99 for a set of four, so I purchased two sets. Finish them off with a gold and white paper striped straw for a fun look. 5. GIRLFRIEND TIP: FINISH WITH A TROPICAL CENTERPIECE! Bring the outside in with these faux tropical plants in modern white vases. Start with a large one in the center of the table and then add two smaller versions on each side. 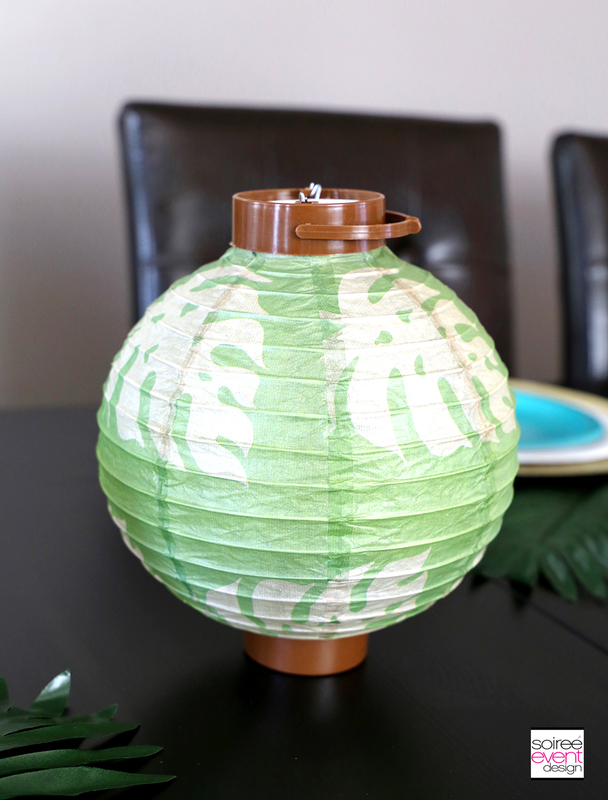 In between them, I added these luau leaf light up lanterns from Oriental Trading. 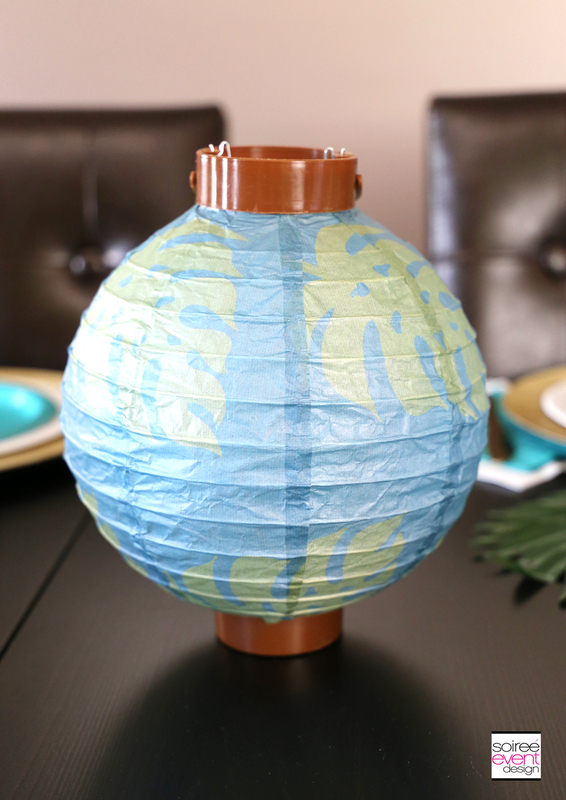 The lanterns are battery-powered and add a pretty glow to your dinner table in the evening. 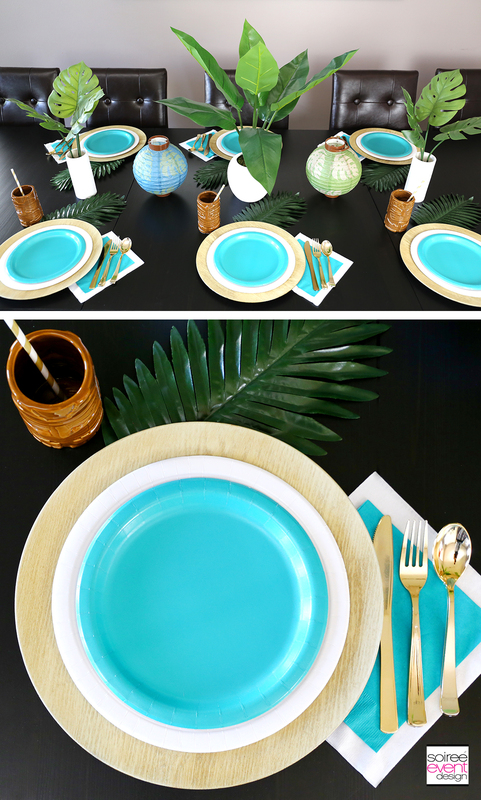 PIN THIS TROPICAL PARTY TABLESCAPE FOR LATER! HOW MUCH DOES THIS TROPICAL PARTY TABLE COST? If you missed the first table, here is the FLAMINGO PARTY TABLESCAPE I shared last week with tips and online shopping list! I LOVE this tablescape! You thought of everything here. The plate color, the cups, the centerpiece – it’s all so perfect. That is so great! The silverware is a nice touch. I love the color of it. Beautiful. Well now I need to be invited to one of your parties! This would be SO much fun! I love all the decorations! It is obvious that you have a good eye for colors and decor. I think that the chargers are my favorite and I would love to own those. Turquoise is my fav color so I think this tablescape is gorgeous! Ooh, I’m liking the plants you brought in for this. The large leave fronds add a lot to the tropical aesthetic. The colors are super cute too. Love this. The plants and the paper lanterns are beautiful. I love all these colors! I might have to do this for fun. My kids would get a kick out of it. I love how well the different elements work together! This would be a great setting for our next get together! 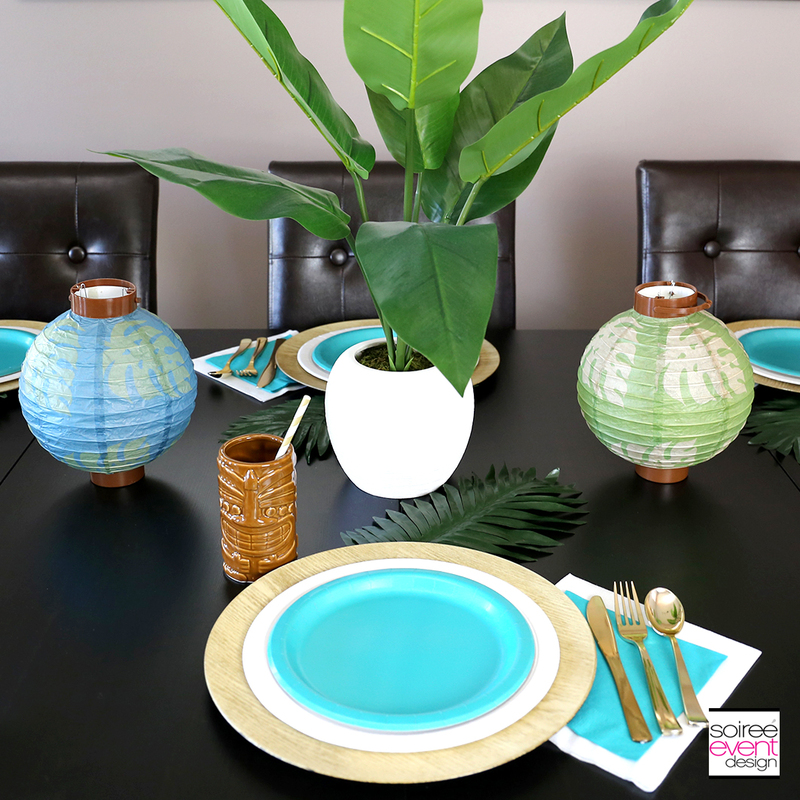 I am loving your tropical party tablescap, that shade of blue is just perfect and the tiki mugs are amazing. Oh my gosh! I love the table. The turquoise color is my favorite and the leaves make it so tropical. I want to do this for a Monday night dinner at home just for fun. I love love your center pieces, that’s a great way to brighten a table. I never do center pieces, but those are things I would have around and would definitely use elsewhere! This is a modern take at a tropical design and I can certainly appreciate that! I love the turquoise colors! Thanks for sharing! This table set up is awesome! I love a bit of a tiki theme and the colours here are gorgeous! How beautiful yet simple that table setting is. The cost is not near what I would expect. I like that you have ideas for many other parties. I’m ok with using paper plates and these colored ones raise the level a little bit. This tiki glasses are really fun too. I love the colours in your design! I really enjoy the tropics so I get really excited whenever I see anything like this! I tend to go with a Hawaiian spin with mine and always end up with pineapples somewhere, lol! I absolutely adore this tablescape. I love the color combinations. And the leaves add something almost magical to it. So pretty. I love the tropical colors. And the plants on the table is a great touch. This looks like a really pretty tablescape. I love the colors you chose which really POP! This is so so cute!! I love how you put the table all together and doesn’t seem like it cost that much either. Such a beautiful and easy tabletop design. I love it! It’s so creative and budget friendly. The colors definitely have a breezy-island-like feel. 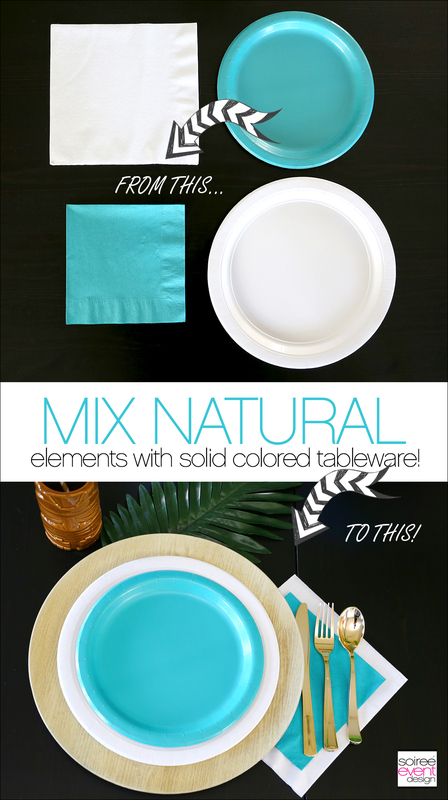 The solid color disposable plate idea is genius! It’s super modern! I always get a print and then it looks hokey. This is really cool! I would love to try this theme for our next party! What a great tropical tablescape! I love the simplicity of the design. How fun! Great tablescape. I never have the money to buy things like the leaves and glasses but I could certainly use color like this to make it more exciting. I beautiful idea for a party and colours combination look so amazing. Lover the way you used the lenterns and plants, amazing table space. It looks so fancy and fun at the same time! What a fun dinner party idea. I love entertaining and this dinner party looks like it’ll be great! This is so much fun! What a great idea especially during those long chilly months. I would love to try this theme out for our next get together. 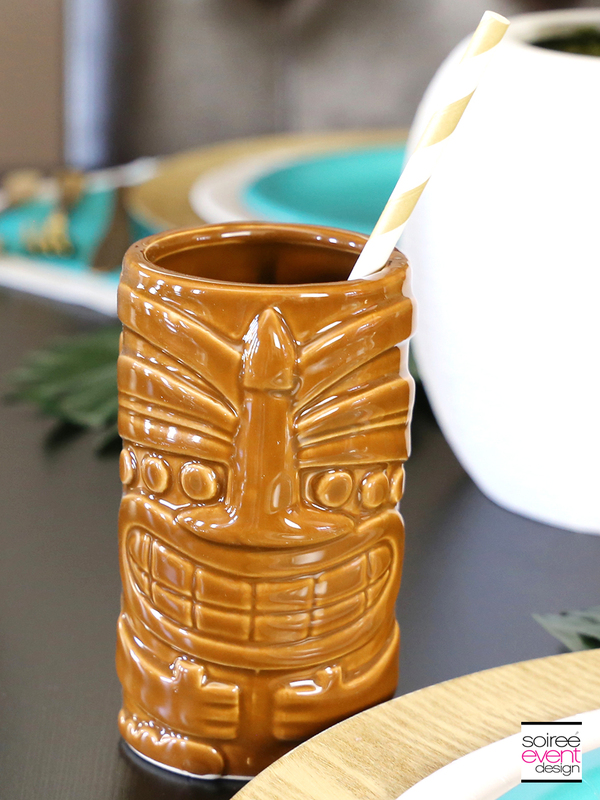 The tiki mugs are such a fun touch! I love the combination of disposable and not for your tablescape. That’ll save on clean-up and looks adorable. Such simple ideas but oh so pretty! I love how the decorations turned out. They’re just perfect. I love all these tips! Especially how you mix disposable with real glassware. Such a great tip! Oh my goodness, these are such great ideas! I live in the tropics too and this definitely gives the tropics vibe. Wow! I really liked the decoration. This looks so sophisticated and chic…I am going to try this definitely! I like the harmony in the colors. It’s very soothing to the eyes, and very natural. lovely setting! Definitely pinterest worthy! I’m so inspired to pay more attention to all the details now! That mug is gorgeous! Where did you get them? I love the table display very beautiful and the colors are perfect. I need to borrow your idea. I just love this style and will consider when preparing for Rosh Hashana! We will be having a lot of guests and I will need a lot of ideas. I love the aqua color scape. It is truly beautiful! I would love to have a last summer soiree like this. I really love this color combo. Where we live is called The Beach District and this would be a good standby for any parties we have! This is so perfect! I adore the color scheme. Beautiful table scape! This is so cute! I love how you got the tropical feel without going extremely overboard with it! Great look! These are such great, practical tips! I never would have thought of styling my plates like this. Thank you so much, I will use these tips in my catering business. I am totally game for anything tropical especially since I love the beach (and the beach life)! I think this tablescape is spot on! It looks beautiful. I loved the tips you gave and the center piece is my favourite. I am going to try it next time I have guests. Loved all the tips .But I would replace the artificial plants for real ones .The setting is soon pretty ! Loved all the tips .But I would replace the artificial plants for real ones .The setting is very pretty ! As always you have a great girlfriend tips! Those tiki glasses are so much fun. I really like how you mixed paper goods with the wood chargers, planter and lanterns. The party has a fun tropical, outdoor feel. These plates look so nice. Blue and white look so good together. The decorations you chose are great. I really love the blue plates though; it really takes the setting up a notch. I love this! Such a beautiful table setting! I love making our dinner table look beautiful like this, but I definitely don’t do it enough. This table scape looks fantastic! I love the color and the contrasts too. Thanks for listing links to other themes. Now that the holidays are fast approaching, this would be a good resource to have when inviting guests over. I am utterly gobsmacked! I can’t believe that the tablescape above really is paper! I can’t believe it. I feel like with paper t has this negative connotation of “it’s just paper” however the outcome is amazing. BEAUTIFUL! I am all about some great tablescapes and this is simple yet gorgeous. Love more importantly that it is not ridiculously priced. These are such helpful tips. I love those tiki glasses. So elegant! That is really fun set up! This is really helpful and I love the theme and the colours are pretty cute. Those look like great table setups for a tropical party. The gold with the white and blue really does punch and they really work when you include the tropical looking pieces to go with it. Excellent setup and design. This tropical tablescape is really awesome. Even if it’s not tropical in a country, this style will always look cool and adorable. The table is so beautiful! I love the tropical theme! The blue plates are super pretty against the white. I will have to give a tropical dinner party soon! Apart from the brown tumblers I loved everything else. It really is easy to create such a table with a few well thought details! I love this. I think a tropical party would be so much fun. Lots of options and ideas to do and make look great. I really love this ideas! It’d really well thought out and looks great. You’ve definitely inspired me to have a tropical party! Beautiful set up and that blue and white combination is bringing so much brightness and liveliness. Your tablescape looks like vacation! I love how you mixed pieces together for such a comfortable and glamorous setting. I like how you incorporate affordable paper plates and napkins into a beautiful table set up. Love the color theme of tropical party. Creative! Wow your table is decorated so beautifully. I love combination of these colours. Great idea for a party! I love the look of the table. The colors are great as well. This is so cute for a themed end-of-summer bash! Great setup and suggestions. The colors are really beautiful, too! It looks so lovely, perfect for a grown up, summer dinner party, or even an end of summer celebration. wow!This is so pretty.The blue plates are really matching with this arrangement and gives a pretty attractive look.If I do such tablescape,I may never think of matching such colour for this tropical theme. I love this tablescape. It really looks perfect for a simple party. Thanks for sharing. I’m not having a tropical party but this is cute. I might have to just make this my everyday tablescape.